Low protein dog food is manufactured in both dry and canned varieties. The protein is lower than the protein in normal dog food and is often recommended by a veterinarian to address certain health issues. Many of these foods can only be obtained with a prescription because feeding your dog food that is too low in protein can be harmful to healthy dogs, so always speak to your veterinarian before switching your dog's food to a low protein diet. The protein requirements for a dog will vary with the age and activity of the pet. Doctor's Foster and Smith lists some of these requirements, with growing puppies, lactating mothers, or performance dogs requiring a higher protein level. An average adult dog needs a diet that consists of about 18 percent protein. A low protein diet consists of less than 16 percent protein. Prescription brands are usually recommended if your pet has serious liver or kidney disease. While you can probably find a low protein dog food on the shelf, these diets are not formulated to meet all the other needs of a patient with these diseases. If your pet refuses to eat any of the prescription diets, a home-cooked option can be created by a veterinary nutritionist. Purina Proplan Veterinary Diets NF Kidney Function contains 14.4 percent protein, reduced sodium and low phosphorus and B-complex vitamins. It comes in both dry and canned preparations. Hill's Prescription Diet l/d, designed for dogs with liver disease, has moderate levels of protein at 17.8%. It comes in dry and canned versions as well as bags of dry and soft-baked treats. It's also high in L-carnitine and L-arginine and low in copper, with additional antioxidants to improve health. Hill's Prescription Diet k/d, designed for dogs with kidney disease, contains 16 percent protein. It is available canned in Chicken & Vegetable Stew and Beef & Vegetable Stew flavors. Chicken flavor is available in both dry and canned versions. Omega-3 fatty acids, L-Carnitine and essential amino acids at appropriate levels are also ingredients. Royal Canin Veterinary Diet Canine Renal Support comes in dry versions A (aromatic), F (flavorful) and S (savory) and for canned food D (delectable), E (enticing) and T (tasty). Protein percentages vary by flavor but run from a minimum of 2.5 to 7.5% for the canned versions and 10 to 15.5% for the dry versions. Royal Canin contains a guide for mixing the formulations to keep your dog happily eating. Diamond Renal Formula for Adult Dogs is a dry dog food with a minimum protein level of 13%. It is specially formulated for dogs that show less interest in other diets due to palatability. Blue Buffalo Natural Veterinary Diet KS has a protein level is 14%. This grain-free low-protein dry dog food is made with their trademarked "LifeSource Bits" process to improve the nutritional impact of the vitamins and minerals. Canidae All Life Stages Platinum - This food is made for dogs with lower activity levels, such as seniors. It has 22.5% protein and comes in a dry version made with chicken, turkey, lamb and fish and a canned version made with chicken, lamb and fish. There are two treat versions: one made with lamb, wild rice and sweet potato and one made with turkey, quinoa and butternut squash. Eagle Pack Original Lamb Meal & Brown Rice - At 23% protein, this dry dog food is an "all-natural" brand with ingredients like oatmeal, brown rice, and antioxidants. It's designed for dogs with a normal level of activity. Natural Balance Limited Ingredient Diets (L.I.D.) - Natural Balance's L.I.D. sweet potato & bison dry dog food uses bison as the protein source and has 20% minimum protein. The limited ingredients are grain-free and focus on high quality instead of artificial preservatives and fillers. They offer other dry food flavors with low protein percentages: fish (21%), duck (21%) and venison (20%). Canned versions are also available. Healthy animals excrete uremic toxins in the urine, but these toxins can build up when a dog has kidneys that are not functioning properly. Digesting protein produces the toxins, so you can keep the toxins at lower levels by limiting the protein in your dog's food. This way his body will not have to work so hard. Low protein food may be prescribed by your vet for a number of reasons. Although many people think that they should switch to a low protein food as their dog ages, this is not necessarily true. Low protein foods are indicated when there are serious health problems, generally those that affect the kidneys or liver. For pets with liver disease, protein restriction is not always recommended. Make sure that you speak with your veterinarian about your dog's specific needs. Besides just trying to find dog food that is low in protein, you should also look for food with high-quality, easily digestible protein. Generally, dairy, egg, chicken, and soy are great protein sources for pets that require low protein diets. All the prescription veterinary diets on the market contain proteins that are easily digestible. Diets for kidney disease will usually have low phosphorus levels, and are supplemented with potassium, B vitamins, buffering agents, antioxidants, and omega-3 fatty acids. One of the most important factors in feeding a low protein diet is palatability. A lot of the flavor of the food is in the protein, and dog food with limited protein can be tasteless. You may need to try dry or canned varieties, or a couple of different brands to find one that your dog likes. 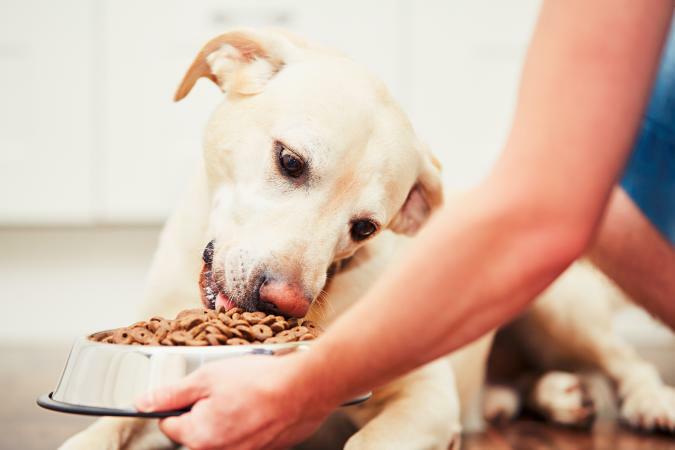 Whenever you change your dog's diet, try not to offer too many varieties at once and mix the new food together with the old food gradually over a week to prevent an upset stomach or diarrhea. Dealing with a sick pet can be overwhelming, but low protein dog foods can actually increase the survival time and the quality of life in dogs with chronic kidney disease. Always follow your veterinarian's advice and continue to feed your dog the low protein diet as prescribed to keep your canine companion healthy for years to come.